Boone plays Sunday, January 8, with Christopher LaMarca and editor Katrina Taylor in person, as part of Museum of the Moving Image’s First Look 2017. Boone, an unrelenting cinematic experience from filmmaker Christopher LaMarca, opens with a formal challenge and in complete darkness. From an empty black screen, light slowly emerges and abstract shapes begin to appear. These small orange silhouettes, created by a simple flashlight, gradually create the space we are in. We hear crickets, indicating that we are in a rural setting. Here, a haunting scene is taking place: a baby goat is being delivered by farmers, the camera intimately positioned only a few inches away from the event and sparing us no graphic details—a typical moment in a film driven by characters, but which is inseparable from their interactions with nature. This film creatively registers the ways in which its maker is inextricably bound up with the documented world. Attending to others’ perceptions, not just his own, becomes an integral element of LaMarca’s inquiry. Later in the film, the same farmers will hopelessly try to help a dying sheep, and another dog in the farm will face the same fate. This is life here: some animals are born painfully, others die quietly, and the cycle goes on. Transporting the viewer into a country setting where a unique way of life is gradually disappearing, Boone comes with no expository voiceover, respects no dramaturgy, and excludes any interaction between filmmaker and subjects. It depicts the day-to-day experiences of three young farmers in Oregon, including milking goats, feeding animals, harvesting tomatoes, stirring pots of creamy goat cheese, and other forms of physical labor. While it may be categorized as a work of nature ethnography, in which landscape, animal, and farmer are each identified as a crucial element, it also rejects any typical pedagogic aspirations, its ambiguity frustrating any easy interpretation. LaMarca, who served as a photojournalist of environmentalist concerns before stepping into this project, follows some traditional traits of anthropological cinema here. He lived on the Boone farm for two years, observed his subjects day and night, and accumulated more than 500 hours of footage, which he eventually cut down to 75 minutes with the help of editor Katrina Taylor. LaMarca is interested less in an authoritative rhetoric than a purist, straightforward approach to filmmaking; the film’s subjects are recorded and observed patiently through direct-cinema strategies. It redefines the familiar structure of a nature documentary, following in the footsteps of other patient ethnographic films, such as those made by David and Judith MacDougall, and thus aligning itself with the recent aesthetic turn in observational ethnography. Boone’s official website describes the film as “a sensual homage to the heart and soul of a farmer,” guiding us to consider it within the trend of experiential documentaries. Indeed, it is tempting to discuss Boone in terms of its potential to plunge viewers into the audiovisual praxis of its sensorial aesthetics, to provoke us into experiencing what it feels like to be on the farm and engage in its daily activities. In that sense, Boone is a film that generates an immediate, corporeal, and pre-linguistic experience of reality. 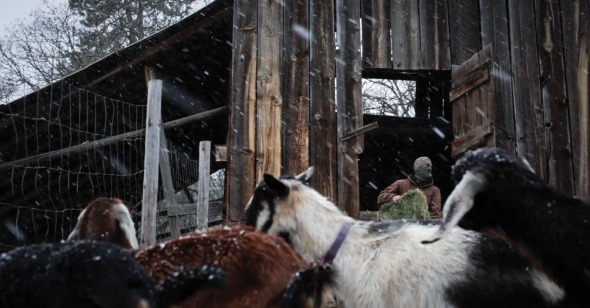 When it is heavily snowing, an intimate soundscape gives the impression that chilly snowflakes are landing on our faces, and when the farmers stir pots to prepare goat cheese, tactile cinematography almost simulates taste. In another memorable moment, a farmer rips off the feathers of a slaughtered chicken while banging its body on the table. The intensified sound and vertiginous cinematography generates an inevitable disgust. Interestingly enough, LaMarca confesses that he watched Ilisa Barbash and Lucien Castaing-Taylor’s Sweetgrass (2009), a similarly transgressive and experiential anthropological work, about sheepherders in Montana, only after making Boone. Whether the inevitable comparison between the two is supported by authorial intention or not, Boone seems to be a typical product that emerges out of the legacy of Sweetgrass, and more specifically the Sensory Ethnography Lab at Harvard University. The idea of gaining knowledge through experience is central here, and the attempt focuses on evoking the life of the farmers in a manner that both lets their world speak for itself and produces a synesthetic participation that strives to immerse a viewer within the events as they unfold. It is, one may argue, direct cinema of the senses. Following the SEL’s defining trademark, Boone constructs a careful soundscape, the effects of which often supersede image, working against the bias toward vision that traditionally characterizes observational ethnography. Many scenes take place in the dark, which grants sound an extremely powerful role. The process of de-anchoring the voice from its observable source, as in the opening sequence, is achieved through a tension that exists throughout the film—between the actual and the artificial, the observational and the aestheticized. There is no music in the film other than a few notes of diegetic piano playing, and the minimal dialogue does not really explain things in an expository manner, instead delivering some fragmentary insights into the farmers’ lived experience. Twenty minutes into Boone, a radio broadcast obscurely explains some essential details we may have already figured out ourselves: “Once a farm goes away, it rarely comes back.” Here is another effort to document vanishing forms of physical labor that are threatened by economic development, like the Norwegian American sheepherding family in Sweetgrass or the community in an industrial zone fated for demolition in Verena Paravel and J.P Sniadecki’s Foreign Parts (2010), another typical SEL production. We discover that farmers Michael, Dana, and Zack are torn between their passionate devotion towards the farm and the inevitable reality check they need to face. What future can there be for a private-owned farm struggling financially and fighting state regulations? Thus the sensorial journey we embark on is already an historical visit, a momentary experience of stepping back in time.